These are related to the 2019 Spring Festival news, in which you can learn about the updated information in 2019 Spring Festival, to help you better understand and expand 2019 Spring Festival market. 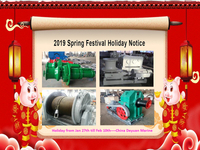 Because the market for 2019 Spring Festival is evolving and changing, so we recommend that you collect our website, and we will show you the latest news on a regular basis. We would like to say thank you very much for your strong support all the time. Your support is the lifeblood of our business, we want to extend a big THANK YOU to you and your family for being one of our amazing customer and help our business grow. Deyuan Marine all colleagues sincerely wish you and your family: Happy new year, lucky pig year, hope safety and healthy!